Book 632 pages. printed in silver and black. Designed by Mainstudio Amsterdam, Published on the initiative of the Schunck Paleis which curated the exhibition STILLS, 010 Publishers. 2010. This publication on the work of Wiel Arets, edited by Roemer van Toorn, gives the reader room to contemplate the content of the work, such as a photographer creates Stills on the set of a film under production. This time we are not presenting a spectacular monograph of projects full of extravagant images entertaining our zappingculture, but a sketchbook of thought instead. The development of Arets’ ideas is shown in their multitude of thought and action, and the reader is given a set time to contemplate specific themes. On various fronts the different texts enter into a dialogue with the context from which they originated. The chronological development and discussion of Wiel Arets’ work, collected in this compilation of the best texts, articles and interviews, forms the backbone of this book. 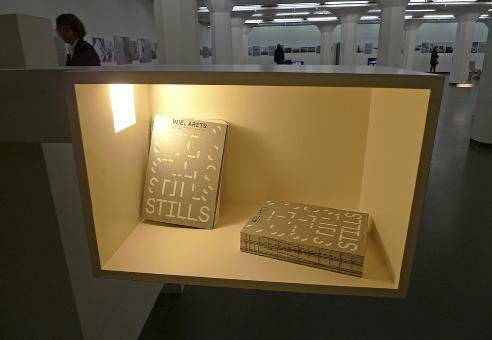 Arets, and many other authors, speak about the work while in the background architecture photographed by Jan Bitter unfolds along a horizontal timeline of realised buildings in silver, black and white. Moreover, the dialogue will also be carried out another way. This timeline of texts, articles and interviews does not only contain official texts, but includes lecture notes, short statements, conversations, critical observations, significant readings, radio interviews, an inaugural speech and for example texts written with colleagues, in order to give an overview of the context in which Wiel Arets developed his thought.